The SK350D is a very popular machine in the Japanese market, used for recycling and material handling. Currently this machine is not available in Europe, but as this scale model is so special we couldn't resist offering it to our European fans. To buy this model click here. This model comes with an elevated cabin and a real magnet. We sent this model to journalist Steven Downes at Plant and Machinery Model World to review for us. PMMW is an English collectors magazine. The following review was in Issue 23 - September/October 2017. 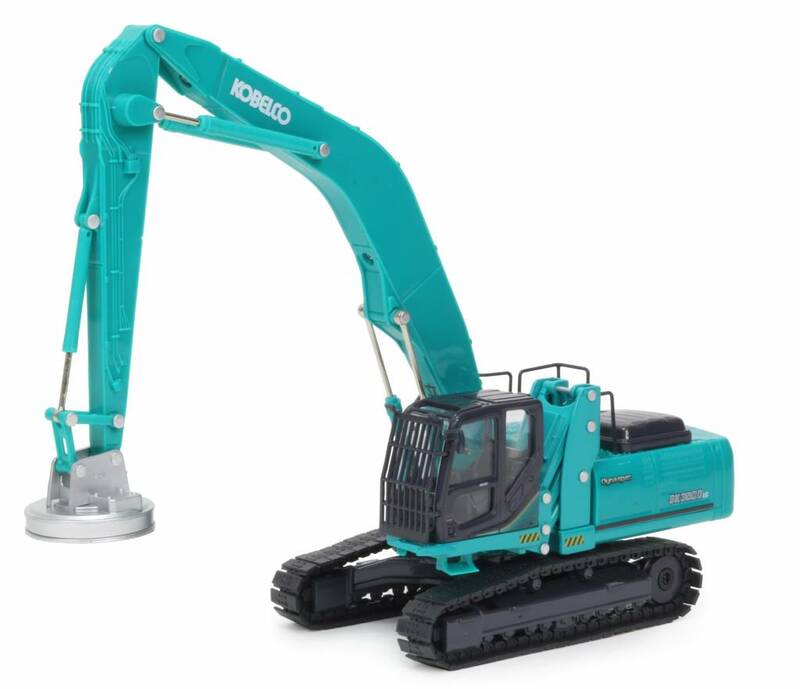 Presented here is the 1:43rd scale Kobelco SK350DLC excavator which is fitted with a material handling boom, stick and magnet. It appears to have been produced by the same manufacturer as the SK400D Demolition model and has a fair amount of plastic used for the construction, including the boom and body. Starting with the undercarriage, the individually linked pads have a smooth surface with indents visible representing the bolt fixings. Both drive and idler wheels are basic and the tracks rotate freely. The cross member and track frames are metal and add weight to the model while the pads themselves are plastic. The cabin has a replicated interior which highlights the interior panelling, driver’s seat with armrests and control joysticks with levers for steering, safety hydraulic cut off lever and display console all visible. The exterior of the cabin has a rear view mirror and front protective screen which has integrated work lights. The cabin is mounted to a hydraulically operated riser to provide a better view of the surroundings and this elevates smoothly with enough resistance to stay in position. The attachment is a magnet which is mounted to a linkage rather than the usual method of swinging freely. The magnet casing does have a strong magnet inside and is capable of picking up small metal parts which is a nice feature. The curved main boom and stick have hydraulic pipe work integrated into the castings but there are no flexible hoses connecting to the cylinders, something which can be added by a collector to create more realism. A number of auxiliary lines have been cast into the sides of the stick offering the option of fitting other attachments. The electrical generator unit has also been included, standing on the front of the main body with plastic safety railings found around the upper engine area. The body casting has plenty of surface detailing including counterweight lifting points and raised covers while printing has been used to recreate the anti-slip panels. The range of movement of the boom, stick and linkage is good, with cylinders stiff enough to hold any pose. The model is expected to be available later this year from the new Kobelco online merchandise store. Thanks, we are glad you like it. Send us some photos when you receive your model. Very nice scale model, with great attention to details. Will be a great addition to my collection.